Kristian’s Knowledge: What is frogging? 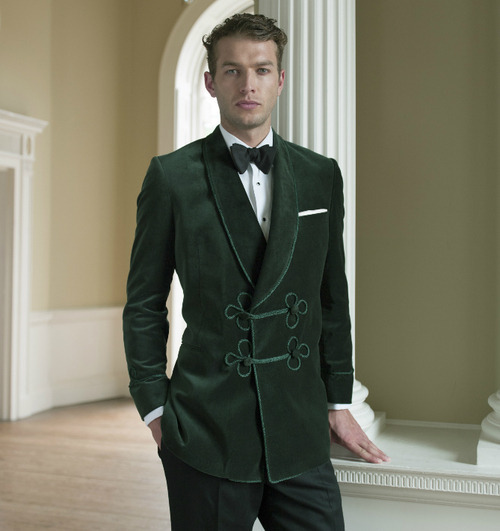 The smoking jacket is traced back to velvet dressing gowns in vogue some centuries ago - later emerging as a classic jacket and the answer to what to wear entertaining at home. But what is frogging and when is it appropriate to wear a frogged smoking jacket? Oliver Brown proprietor, Kristian Robson, reveals the art of frogging. Frogging is an ornamental braiding derived from ‘frog fastenings’. The frog is used to fasten the front of a garment and consists of a button and a loop through which it passes – and it also provides an eye-catching detail. When many frogs are used on a garment, more than is required for fastening, this decorative detail is called ‘frogging’. Frogs and frogging have been a decorative detail since the 17th century when they were used in military uniforms - particularly within prestigious regiments. They were often crafted in luxurious metallic cordings or brocades, and became increasingly elaborate and extravagant. Frogging is hand-crafted, and on today’s garments is most often created using cotton cord. The cord is first pinned into the desired pattern of knot work, then each loop is secured with small stitches on the underside, before the frogging is hand-sewn onto the garment. Oliver Brown has a substantial selection of smoking jackets, in an array of colours and sizes, from classic unadorned styles, to Nehru collars and silk velvets. Every smoking jacket is a personal choice but the frogged smoking jacket is the bastion of the style – traditional, and anything but plain.